How tall is your highest heel? 4 inches? 5? Better yet, how high do you think you can go before toppling over or at least spraining an ankle? Romanian shoe architect, Mihai Albu, hopes you'll be able to go higher than 12 inches. He's banking on your ability to walk in 12.2 inch heels, to be exact (and pay $1525 for them). It's amazing the way the three platformed wedges are stacked- even if it's not all that attractive. If I had the extra money, I might be moved to purchase them as display pieces- but not to wear. Still, shoes are getting more and more ostentatious these days with their embellished heels, cutout wedges and stylistic quirks. What say you? Haute couture or hot mess? Haute couture or hot mess? I'll go with hot mess. I'll have to agree with you G+C. He does have some others that are more attractive, though... stay tuned. Completely impractical, but a work of art nonetheless. 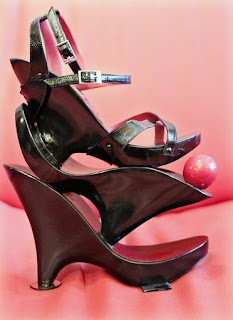 Still, I've seen better - if Nicholas Kirkwood made a 12" high heel, I would consider it! Anna, I'll post some of his more attractive shoes soon. I'm not a fan of this one aesthetically, but I had to post it for the art value :-). I'm sure you understand. Amor, I don't have a problem with 10-12 inch heels (as long as I don't have to take more than 2 steps in them lol), but this pair is DEFINITELY not on the cute list. Those are crazy! My highest heels are 5.5" and there is no platform and they're definitely not easy to walk in imagine 12"!! That is crazy! I don't even know what else to say.